Oh yes and there will be some data updates too; the mention of DA, SF, WDI etc. waffles that do NOT run off the edge; I will clarify the difference between those and a true "fake" border. Also, it may include info that I will post for discussion about something my wife calls "bunny ears" on the backs of some fakes; we now have a couple of fakes in our possession that do not have a border, but the mickey heads in the waffles are so distorted they look less like mouse ears and more like bunny ears. And if I hear anything else through the grapevine, I'll throw it in too as long as it can be well proven. What a great pamphlet! I'd like one. And I love the picture of the next generation of pin traders in your pamphlet. No, I am not an editor and not really a writer, though I did write a cook book 20 something years ago (its all over google). I write eCommerce web applications, ASP and SQL programming and have been doing so for the past 11 years. But I do nitpick things to death. Its both a gift, and a curse (as my co-workers put it). You can use anything I posted, no credit needed. I don't get off on credits everywhere, not my gig. Use what I give you, make something I can use. Help the community. We're good. I had not intended you to put the entire definition of "scrapper" in. I only thought you might read through the possibilities and derive some of your own ideas/words from them. As far as the Disney images, why not take photos of some of your pins, maybe cropped shots of a lanyard with pins as space fillers. I don't think Disney has issues with photos of pins but the full university logo, I think they might take objection too. As long as you took the photos (or got them from a non-Disney source), I think you are good to go. Pins laying on pins so you don't get the whole character might be good. Something that doesn't indicate you trying to use a specific character or Disney trademark. As far as the photos of the kids, yea, its become a danger zone lately, especially in my line of work (commercial web sites). If they are not yours or someone very close to you, its risky. Trust me, I fully understand why you put them there, and I completely agree with your reasons and usage. Kids sell, especially if they are cute. Put a picture of a cute kid on an ice-cube tray and you could sell cases of them to Eskimos in a blizzard. I also realize that kids, all to often, are the ones hurt by the scrapper/counterfeit industry. I can't tell you how often I got scrapper pins from kids, even back in '06 at WDW. Sometimes I would have a talk with the parents(away from the kids) and help them to understand what to look for. These pamphlets you are making would sure help here. Not once did I deny a trade with a kid because they were handing me a scrapper, its NOT their fault. I would just put the pin in my pocket and throw it in a ziplock bag after they were out of sight so I wouldn't hurt any little feelings. Having example photos is GOOD. Very good! Sometimes trying to explain what to look for is difficult for people to grasp. A simple side by side photo can easily explain it. You might be able to get more on the page if you crop them. For example, the three in the middle, do you need the whole pin? No. Crop it down to just the upper left ear of each. That would focus their attention to the problem spot and allow you to put more in the page. Wolfie!!! WOW!!! You are my new best friend! Thank you for all the input, I really was hoping someone would actually take the time to critique this right. Whew, good. I wasn't sure how you would take it with me being a newcomer here. Hey Geoff - do you have an update to this pamphlet? Also, I was reading back through some of it and have one suggestion.. Instead of 'paint' use the term 'enamel'. Disney pins aren't really painted, they are mostly made of enamel or enamel cloisonnÃ© on a metal base. The enamel has the color. Wow! Thanks for that. That would've saved me a lot of time and money if I had that in the beginning. Version 2.0 is NOW AVAILABLE!!! 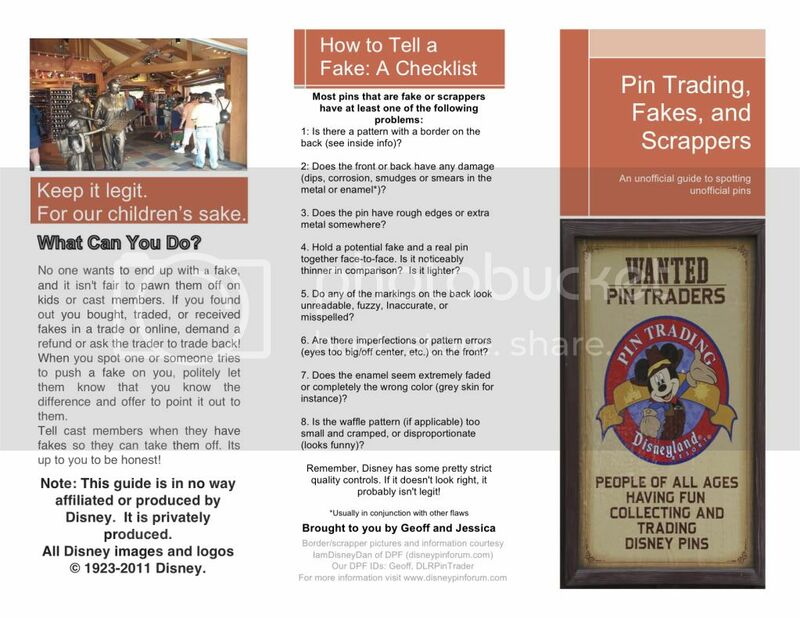 Here you go, version 2.0 of my pin trading pamphlet. I took everyone's concerns into consideration, and now we have the all new, super duper version! I am making the files available both as a PDF and the original Word .docx document so that you may either just print them out, or work on it yourself if you want to customize it. Lemme know what you think!!! 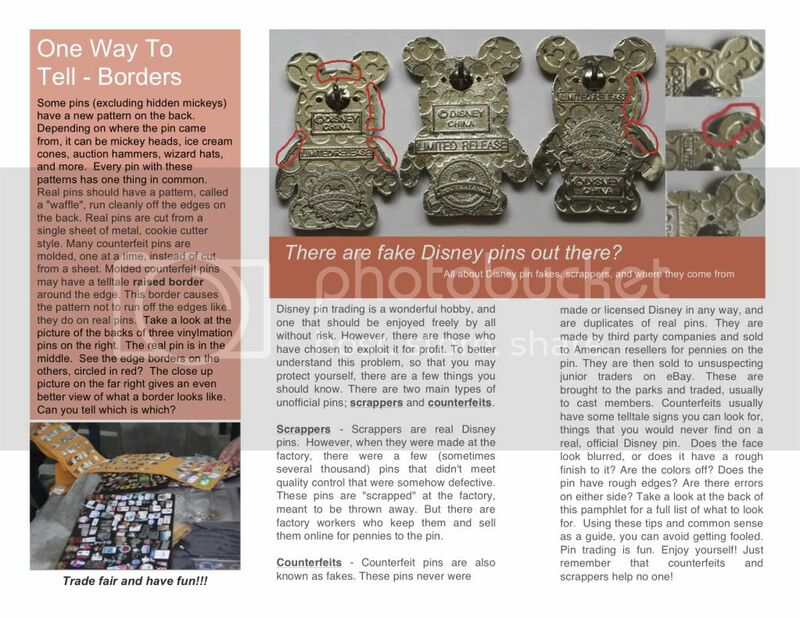 Geoff, in light of the recent releases at DSF and WDI in regards to the back pattern, you may want to put in a caveat that there are legit pins with "waffling" errors. I good number of WDI and DSF pins have errors on their waffling pattern and are even inconsistent at best between individual pins...just my $.02. good job. this looks real nice. Im down to have sum printed up so we can have them with us at the park. i am thinking maybe a full size paper that can be folded in 3rd. or mayb a front and back post card kind of flyer. both can b done cheep and than given to the pin traders that would like them and are at the parks a lot. just a idea. i am always down to help with this. Kidding aside, remember, these tips/pamphlets are for the new, mis/uninformed, and in dire circumstances the truly ignorant. I would say 95% of the ones I hand out go to people who really didn't know any better, and thought they were getting a deal on eBay, and are only in the park for a few days and are trading just for the fun of it. 99.9% of the time, those that receive these are extremely thankful and appreciative. These people usually won't have DSF or WDI pins for a while because they are new, and when and if they do, they will have been intelligent enough to make the trade, and thus intelligent enough to ask questions from people to clarify any extraneous issues. Every once in a great while, I do get someone who reads it and is still giving me the "I don't give a crap" look. I have a little speech I give them, and they usually turn around. Besides explaining to them all the signs and showing them how to tell the difference (I keep a really, really bad fake around for this purpose), I tell them this: Imagine if you went to a big name jewelry store, one with a stellar reputation, say Tiffany. And you shell out $30,000 for a big, beautiful diamond ring. The salesperson assures you that since it came from Tiffany, it is real and you take his word for it. Now lets say a couple months down the road you need to sell your new bling for whatever reason, and you take it to another jeweler; upon a quick inspection, he tells you its fake, a big steaming gigantic cubic zirconium, and he can prove it. Wouldn't you be a little pissed off? I let them know that while it may not be on the same scale, it is still the same thing. I let them know that is exactly what happened to me. I emailed the eBay seller I got my fakes from, and he assured me that they were 100% real pins, trade-able in any park. He even had some story on the page about how Christian he is, and that his family needs to liquidate for some emergency, yada yada yada. I took my big fat huge stinking bag of 200 fakes to DLR, and traded with cast members all day. I even bought a book to put them in, I was so proud of myself. Then, I went to trade with real traders for the first time. A couple of people flipped through my book, and just said they didn't see anything they liked. But then there was one person with the kindness to quietly point out that I had nothing but fake pins. Talk about embarrassed. Between those two little speeches, people usually turn around. I have added my own handful of members to DPF through these too; people are so grateful to hear that there is a caring community out there, they want to join right away. Sorry for the rant <gets off soap box quietly> but I had been meaning to explain this for a while. Thanks for reminding me Lemec!!! I usually print them out at home, double sided, on card stock. Its really cheap; usually, you can find it at Walmart, and if not there, Best Buy has it. MY printer has the ability to print double sided without me having to reverse anything, so it is a little easier on me. However, I have printed them off one side at a time, then flipped them over and ran through again for the other side. Just experiment with some plain old printer paper first, and number the corners on both sides 1-4 on the front and 5-8 on the back, so you can tell which way it will feed through. You usually have to flip them and rotate them 180 degrees for it to come out with both sides right side up. Either the Word Doc or the PDF should print out just fine like that. I print from the PDF, and tell it to fit to page; it usually enlarges it by something like 104% and it fits perfectly. However, if you can think of a way to make this whole process cheaper, I'm open to ideas; I can print about 100 of them before I'm out of colored ink (black is separate and hasn't run out yet) and a color refill for me is like $48.00. Between that and the paper, it takes it to around $0.52 per flyer to print. good job. I think that we can help slow this fake thing down with eduction. The more ppl that know what to look for. the more ppl that can not be sharked or passed off a fake pin. I am still down to have sum of these printed up nice and neat. So we can hand them out at the park. I got in to pin trading after a long talk with sum traders at the ho. So i also try to spread the pin love. i will give a pin to kids that dont have any or talk to the mom and dad about what pin trading is. It may take a while but in due time things will get better. i also try to spread the pin love. i will give a pin to kids that dont have any or talk to the mom and dad about what pin trading is. It may take a while but in due time things will get better. its all about the kids. even us big ones. got to stick together as a team and take this on. thanks agian for the hard work. have you looked at Vistaprint.com they may have a good deal. i was thinking to have it made into a post card. the stock is thick and easy for ppl to not mis place. i got a copy from J and G @ DLR. Its very nice and a good thing for our hobby. make sure to tell ppl about it. This is very useful and just what I was looking for! Hey Geoff! I was great talking to you last night. Thank you for all of the advice. I'm still confused i have purchased starter sets that also contain pins with those borders on the back? is disney selling scrappers too???? :/ Ugh this is too much to take in! This is great! Thank you for this, I will show this to my cousin, who has so many scrappers in her collection. hey..i hope u guys are doing well...sorry the lanyards are far behind the intended start date. as far as printing thes cheap..im still down to help..just pm me sum time..and i will keep a eye out for u 2 around the park..agian hope u are doing well. Good Job. I have found reading both the flier you made and the Reply Thread Post to be VERY informative. Thank you. Great Job on the revisions of your pin trading pamphlet. I'm a newbie to DPF, and I love all the great advice and integrity I have seen at this site and it's members. I would like a copy of the finial version to print off. Thanks for all the hard work all of you do. I hope to do has will with trading has all of you have. Not ready to trade right now, still learning. Hello! I'm new to the Disney Pin community and have aquired several pins. I have not gotten familar enough with counterfeits and scrappers. I recently received a mickey and minnie in a pink car pin as a trade. According to Pin Pics the pin # is 3450 and was issued by walt disney travel company. The does not look official and I was wondering if anyone would be so kind to post the back to this specific pin or maybe refer me to a site that already has it posted. I came across an obiviou fake recently as well and I was pretty upset. I threw the pin away so no one else would feel my frustration. I hope others will do the same and take any noticeable counterfeits and scrappers out of the trading community.